8184 ft (2494 m) . The Goat Rocks are the eroded remnants of a once-great stratovolcano. One to two million years ago, this cone would likely have been similar in height and structure to typical present-day Cascade stratovolcanoes, reaching over 10000 ft high. But once the eruptive activity ceased, the forces of glacial erosion tore away the outer layers of material, leaving exposed the rocky lava spires where magma once solidified within the conduits of the volcano. The present eroded massif has several peaks reaching about 8000 ft, and the north sides are still host to about a half-dozen glaciers. Most of the approaches into the Goat Rocks Wilderness are somewhat long in trail mileage, so the routes below are all probably best done as overnight (or multi-day) trips, despite the comparatively moderate elevation gains. (24 km) The shortest and most direct route to the Goat Rocks' high point. The route follows a creek for miles from Conrad Meadows, all the way to the relatively gentle and inactive north-side glacier. It then heads straight up the glacier towards the summit. See vol.1, p.71 of the Cascade Alpine Guide (CAG) for a fine route photo. (29 km) A somewhat longer and more circuitous route than the previous, starting from the same trailhead but ending up on the east side of Curtis Gilbert. Perhaps not that great of a ski route, although CAG does mention good glissading terrain on the northerly edge of the Meade Glacier. (20 km) The standard hiking and skiing route into the Goat Rocks, reaching the Pacific Crest Trail at Snowgrass Flat (5800 ft). Follow obvious gentle gullies to Old Snowy-Ives Col on the ridge above and then continue to either Old Snowy Mtn or Ives Peak. 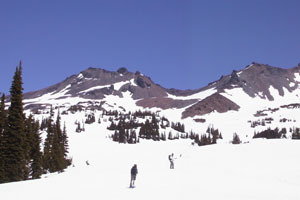 From Snowgrass Flat, many ski runs are possible. (30 km) This route follows PCT southeast from Snowgrass Flat, then ascends north to the ridge crest before reaching Cispus Pass. It then drops onto the Tieton Glacier on the north of the crest, and traverses/climbs east to Mt Curtis Gilbert. (27 km) This route starts from the N Fork Tieton River, climbing to Tieton Pass and then traversing south into McCall Basin. It then climbs directly up the McCall Glacier to the summit. A longer approach, starting from the top of the lifts at White Pass ski area and traversing the long ridge to Tieton Pass, is also possible in winter or early spring.